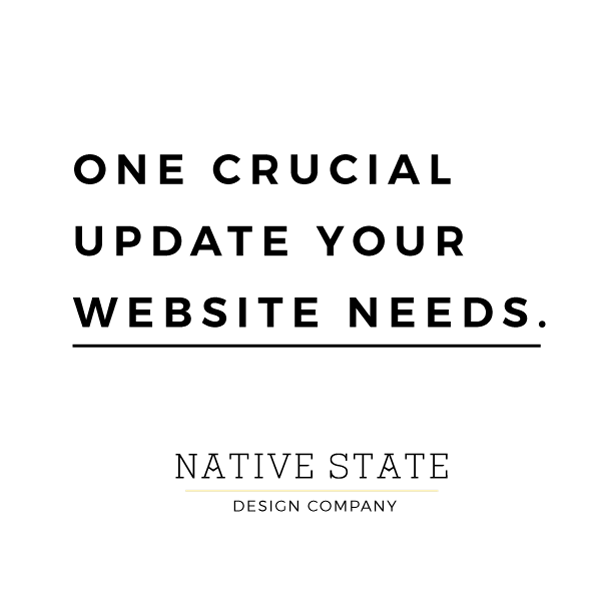 NATIVE STATE | DESIGN CO. One Crucial Update Your Website Needs – NATIVE STATE DESIGN CO.
What is the one thing your website needs in 2016? It’s not SEO, it’s not fresh new pictures, and it’s definitely not background music. The answer? Responsive Design. First of all, what in the world does “Responsive” even mean? Responsive Design is the term applied to web design that changes when viewed on different devices according to their screen orientation (portrait vs. landscape), and screen width. At first, Responsive design was met with some disdain from the design community. Now, it’s the only way to make your website friendly for the vast amount of devices out there. Keep reading for reasons Responsive exists at all, and why you need a Responsive Website. And your user’s first impression the bulk of the time. In pre-web networking, every person that found out about you heard you talk about your business, or heard someone else talk about you. Great opportunities were built in to every interaction as you handed a client a business card and waxed poetic. Fast forward to a few years ago. Now there are many who look at your website, compare you to other businesses by it, make a decision and move on. First impressions are vital. 2. There are more devices out there than ever before. So, you have a great website. The customers that land there see that you are professional, you have spent time or money making it great. You are the obvious choice in your market. Unless, someone is using a device other than a PC. Looking at your site on a mobile device gives you Blackberry-browser nostalgia. Here are some market trends that give some insight on the value of Responsive Design. -Over 20% of Google searches are from mobile devices. -In 2012, more than 50% of local searches were from mobile devices. -In the United States, 25% of internet users only access the internet on a mobile device. -61% have a favorable opinion of your company when your site has a good mobile experience. -25.85% of all emails are opened on mobile phones, and 10.16% are opened on tablets. The number of users that will find you on a mobile device first is large, and growing. As new technologies like smartwatches and who knows what else become available, Responsive Design is the only way to keep up. Say what? Yes, social media. One of the best ways to advertise for your business is social media. It’s free, and the only cost is time and creativity. It’s also a fantastic way to drive traffic to your website. The catch? 55% of Social Media consumption happens on a mobile device. That means when you post about your new blog post, there’s a good chance they will see your website on their phone. In early 2015 Google announced that search results will be altered, favoring Responsive websites in an effort to make searching more mobile friendly. What does that mean? It’s simple, those with Responsive sites will be found first by consumers looking for your product. Ready to make your website Responsive? Contact us here. What do you think? Do you judge a business by its website?